Ultimate Cosmic Evil is a difficulty level card. It first appeared in The Black Goat of the Woods expansion. Setup: Set the terror level to 5. Close the General Store and remove 5 randomly selected allies from the game. Investigators that begin in the General Store instead begin in Rivertown streets. 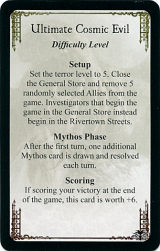 Mythos phase: After the first turn, one additional Mythos card is drawn and resolved each turn. Scoring: If scoring your victory at the end of the game, this card is worth +6. This page was last modified on 21 March 2010, at 12:49.